I stole this video from the MuZicoSphere blog - sorry Sémi, it's just too good and I couldn't not show it here! It makes me feel positive about mankind to know that this guy, Diego Stocco, can conceive, build and play this instrument, compose good music, record and shoot himself, edit and mix and offer his work on the Internet... Poor Lady Gaga who has to pretend she's a musician and release muzak for morons just to show her clothes! : Guitarz - The Original Guitar Blog - now in its 9th year! 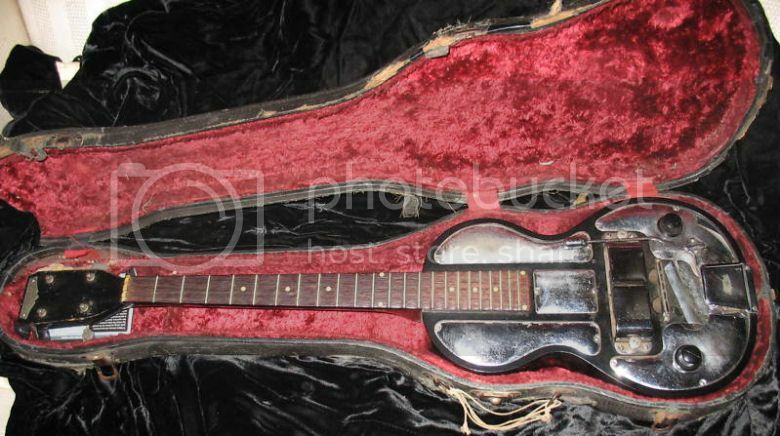 We've looked at many vintage guitars on this blog, but this one is positively antique. It is a 100-year old 11-string classical guitar by Breyer Hermanos, who - according to HarpGuitars.net - were a publisher of tango sheet music and also a music store in Buenos Aires. I wonder if they had their own luthier or if they simply applied their brand name to guitars from other manufacturers? I have no idea how this is tuned or how it should be played. Two of the five additional strings are over the fingerboard and so could be fretted but the other three are off the edge of the neck itself, so technically you could say that this was a harp guitar. The additional strings seem to have been strung up to the machine heads in a rather bizarre order, as the photo below shows. Whether there is a good reason for this, I do not know. Note also that there are in fact 12 machine heads even though it is an 11-string instrument. The maker must have been striving for symmetry, despite the fact that the headstock already looks lop-sided against the neck with the three harp strings hanging off the edge. When you consider the facts, you might think this guitar doesn't have a lot going for it. It's inspired not only by Jack Black's comedy metal act Tenacious D, but also by a computer game called "Brute Legend". (And let's not dwell too long on the subject of computer games. G****r H**o and the like are very much a tabboo topic on this blog). But you know what? I quite like it. It's obviously informed by the Flying V, but I like the shape, the carving, the colour of the timber. As a design - even for comedy purposes - it is quite aesthetically pleasing. 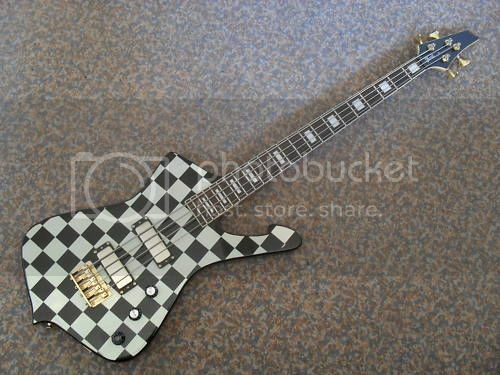 Apparently the Brutal Legend Promo 'Love Giver' Guitar - as it is named in the eBay listing - is from a strictly limited run of guitars that were given away as prizes by EA Games. Or something. (I need a teenager to translate, I think. I know nothing about computer games and care even less). 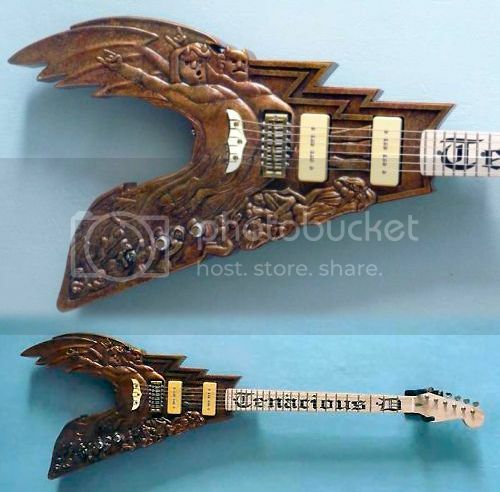 I'm not sure who actually built this guitar or how many were made. If anyone can furnish us with this information, please use the comments below. Of course, this isn't the first computer games-inspired guitar we've looked at. There was the ridiculously named and cartoon-like Fernandes Um Jammer Lammy, not to mention a Sonic The Hedgehog guitar (did anyone seriously think that character looked even remotely like a hedgehog?). 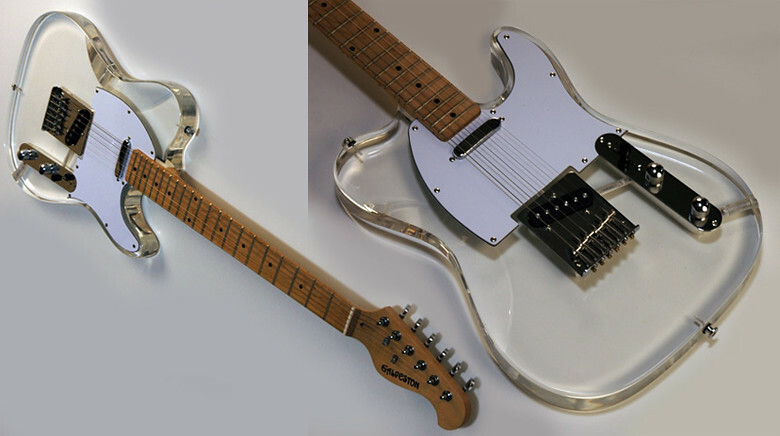 Can't tell about the quality of its making or its sound, but this acrylic body tele by Galveston is really good looking, that's a gift I would make to a beginner guitarist! I received a very kind and generous offer to see Adrian Belew last week at Joe’s Pub in Manhattan. It was an opportunity to meet someone I had been doing business with via phone & email for over a year so I was looking forward to the evening on two levels. It was about now that I really noticed how cold it was in the venue. As it was incredibly hot out all day, this was welcome and refreshing. My friend showed up with his wife and we had a chance to meet in person and talk a bit before the show started. It went great and it was a real pleasure to finally put the face to the name. He and his wife are big fans of all things guitar, so the conversation took off like a Saturn V rocket. Out of the blue, there was a surreal loop of music that seemed to come from everywhere. The refreshing cold was starting to feel less refreshing and I found myself counting my goose-bumps, but it was kind of an interesting background to the loop...kind of like visiting Santa's Shop at the North Pole, while peaking on acid. Finally, Adrian Belew walked out to a warm and generous applause. He immediately kicked into a riff and within seconds had sampled it, looped it, built some more complimentary riffs on top if it, and then was singing the melody. At first I thought to myself: “Well, this is pretty much what I expected: loops, layers of loops, and then melodies on tops of the loops… I mean what else can one guitarist do for two hours…. ?” But as he moved into the second and third songs, Adrian wove a tapestry of rhythms and sounds that was quite interesting. After about five or six songs, he had a Q&A session. It was pretty cool to see die-hard fans so excited as they were able to ask him about things they were interested in. There were questions about his audition with Zappa’s band (his answer included a great story about a five year old Dweezil giving him the finger as he rode around on his tricycle), King Crimson, Bowie, Fripp… all good stuff and he was very gracious about answering a few zany questions. The waitress asked me if I wanted another Coke. I said “Sure, but no ice this time please…. man is it cold in here…” She brought me my Coke, but could offer no remedy for the cold. Back to the music, and there was plenty of it. He was using the Adrian Belew Signature Fly and it was impressive. At one point there seemed to be two tunings in use at the same time. I’m usually pretty good at deciphering this kinda stuff, but I must admit, I couldn’t quite figure out how he did it. My only guess is that he was able to route the output of each string individually and use pitch shifting to create a custom tuning scheme, while blending in standard tuning. One of the last songs was a piece that was building very nicely; he had created some layered loops and was doing this east-Indian-flavored solo that was just awesome. Right at the climax point of his solo, there was a series of sub-sonic tones that was so low; it felt like it was coming from under the building. I It was as if three accompanists had hit their low “B” strings on their five-string-basses at the same time… I could not figure out how he could make a sound that low. It was such perfect timing…. a random accompaniment from a NYC subway train that was totally a part of the music (I still can’t figure out if it was a fourth or a fifth below what he was doing, but it was in tune with the song). It was the first time in the whole night that I completely forgot that I was freezing cold…. While being totally random, it was one of those moments when you really get what an artist is shooting for. I was smelling the spores, drinking the cool-aid and a renewed fan for sure. Summary: I first saw Adrian Belew in college in 1983 in a park filled with about college 3,000 students. It was very (very) hot out that day. I remember well because he spent a lot of time tuning between songs and commented on it often, saying that the heat was a “bit of a problem”. It’s funny how 27 years later, in a freezing cold room, the temperature was no problem. Of course, a big reason for that is the very well made guitar that he was using this evening vs. the guitar he used back then. I don’t remember too much else about that first Adrian Belew show as I was, uh… well, in a very “Celebratory” state that day. 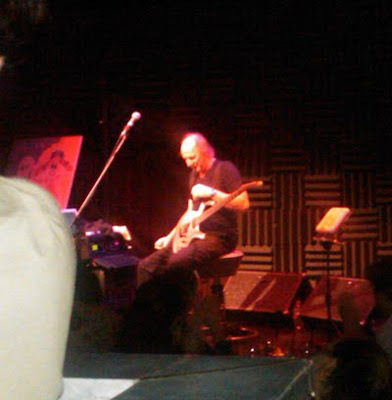 It was a much different experience last week at Joe’s pub. I was more tuned in to every subtlety of what he was doing. What made it so much fun is that at times, I could not keep up; both rhythmically and harmonically, he was wondering into some pretty odd parts of town that in moments, were over my head, even when I quietly tried to tap the quarter note on my leg… a few times, I lost the beat. A nice icing on the cake was that my friend and his wife knew Adrian quite well. I went back stage with them as they wanted to say hello. It was great to see what an incredibly nice, humble and down-to-earth guy he was. They made plans to meet up later and off we went to have some drinks. It had been a long day for me and had to get some sleep, so I was not able to join my friends as they meet up with Adrian. It would have been interesting to meet him personally and have the chance to talk shop. But as they headed off to join him, I had to say goodbye, and wandered out into the night, going over in my mind, the many moments in the show that I had really enjoyed. Ironically, as I walked along 8th street towards Broadway and then 6th avenue, I had to laugh out loud: I was so happy to be back in the sweltering New York City heat! Actually this Fender Telecoustic Paisley is there only on its aesthetics, the Telecoustic models - an electro-acoustic version of the Telecaster - have quite a bad reputation when it comes to sound and music ; but the paisley finish is superb, I my opinion better than the solid body version. To be honest it would be perfect on a shirt - I've been looking for a paisley shirt for months now, Pink Floyd 1967 style, and you can't find this anymore in continental Europe - do you still have this in the UK? What's with the weird frets? 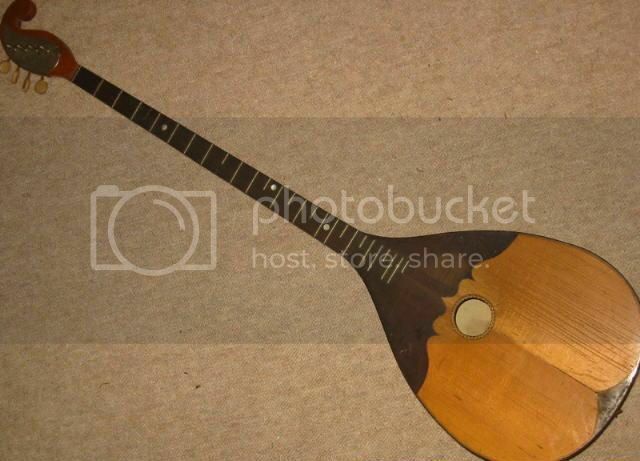 This lute-like round-backed instrument is an interesting one (the seller suggests it may be called a "prim"). Obviously it has a few parts missing such as the bridge and tailpiece, and it isn't strung up, but it appears it would be a 4-string instrument. What is rather intriguing is the bizarre arrangement of the frets. Does anyone out there know how this would be tuned and/or played? Thanks to David Brown for bringing this instrument to my attention. After showing the Eastwood wooden reissue and the Res-O-Glas kits, I couldn't not show the original model - a 1964 Supro Airline. The logo on the headstock is not genuine though everything else is - someone strangely wanted to emphasize the authenticity of the guitar by modifying it! The pickups are not humbuckers but large singlecoils and of course, the body is made of glass-fiber. GLW said so a few days ago and I confirm it, it's bizarre but there are less special guitars this last weeks to be found on the Internet, maybe we exhausted the kind of instruments we like to present here, but since I'm sure it's just provisory, let's say it's summer break! Then we have room for less special but still special guitars, like the Fender John 5 Telecaster Deluxe - it's been released long enough not to give me the bad feeling to advertise for a hype model! 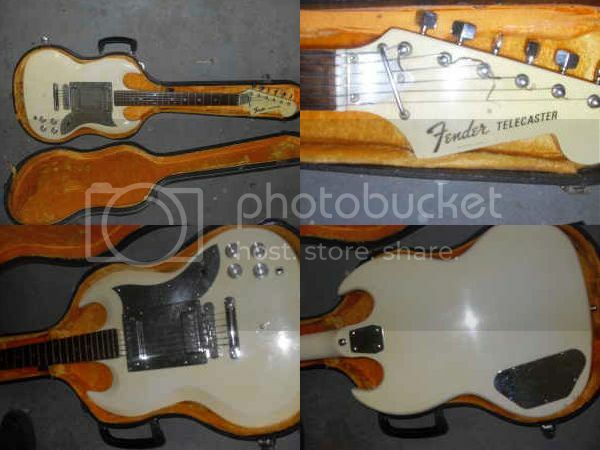 Strangely I little by little get to appreciate Telecasters, and without falling into a cult fantasizing that the first solid body guitar by Leo Fender was definitely perfect, I like its simplicity and iconic status, a good starting point to be playful - as much in music making as in guitar building. I actually prefer the Deluxe model, not for its humbucker sound - a sound is a sound -, but for the strat headstock that is much better than the tele one. And here come the J5 model, with its big chrome Deluxe pickguard and 3 humbuckers, a vintage strat trem, and minimal controls with just 2 knobs and one switch. I'm sure that this guitar can do much more that what it's been conceived for - not a fan of solo John 5, but liked his work in Marylin Manson in its glam - and most creative - phase. I'd be curious to see a J5 in 10 years, after being played intensively by so neo-grunge kid! 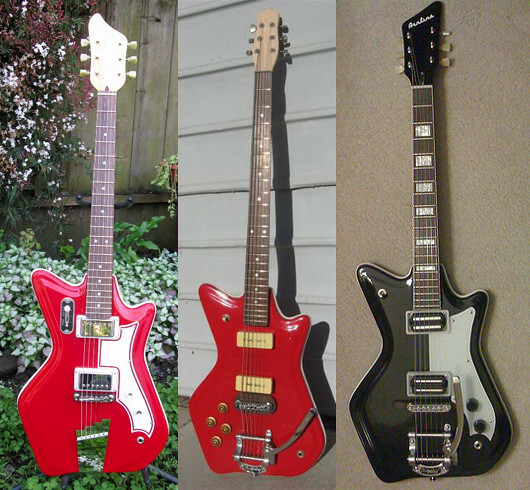 A few days ago I posted about Eastwood's famous reissue of VALCO's Airline - an undeniable upgrade with its chambered mahogany body -, and in the comments we debated about the good and bad of the original Res-O-Glas body - cheap and acoustically disputable, but absolutely avant-garde when it was first released in the 60s. 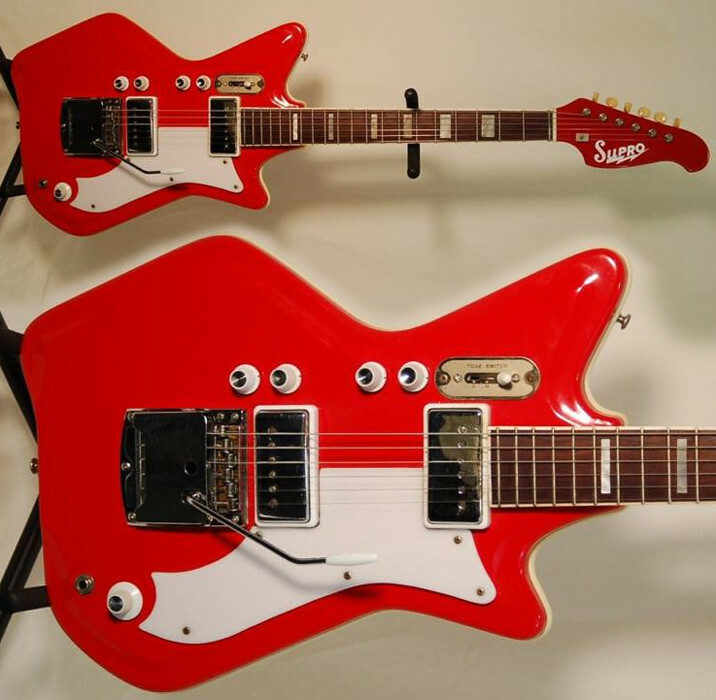 Surfing on the new focus on the Airline line brought by the White Stripes and Eastwood, a company now reissues Res-O-Glas Airline bodies for guitar kits. I like their policy, since they deliberately promote Frankenstein guitars assembled around their bodies with bits of vintage and new gear (some people even get Eastwoods for the neck and gears and just change the body! ), sometimes in the original spirit, often in completely bizarre configuration like one I saw with a Flying V neck that actually fits quite well! They just start to release different models so you don't have to keep to the most famous one to built your guitar, and they also provide a few elements of gears, the most interesting being an art-deco stoptail that will be probably on my next project! Greg Lake used to feel a bit shortchanged next to his colleagues in Emerson, Lake and Palmer. Carl Palmer had a huge battery of drums and Keith Emerson was surrounded on all sides by keyboards. Meanwhile Greg Lake is standing there with just a guitar. 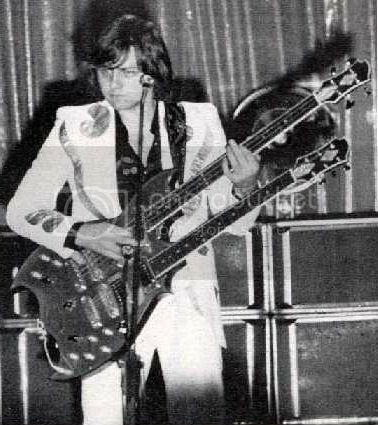 Not only did he try to re-dress the balance of things by marking his territory on stage with a large antique Persian rug, but he also got himself this simply enormous doublenecked guitar/bass. Apparently it was one of only two doublenecks built by the now legendary Tony Zemaitis. Unfortuantely it was also extremely heavy, and so Lake was unable to play it onstage for more than a couple of songs. Deciding it was too impractical, he eventually gave it away. Considering the value of original Zemaitis guitars (as opposed to the recent Japanese tributes - and they are costly enough! ), he must be kicking himself now. 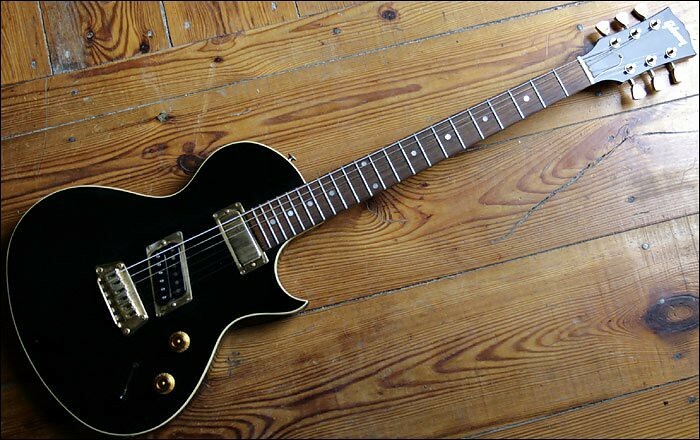 I already posted about the Gibson Nighthawk last year but I just found this model in black finish - I always need to see a guitar in black to really appreciate its line and there again it's perfect - and I couldn't not show it. 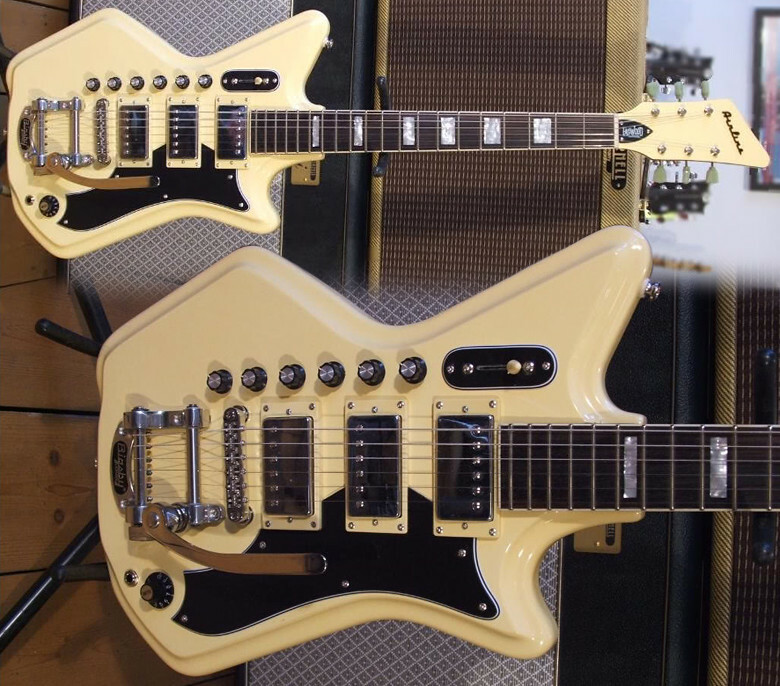 This is probably my favorite Gibson solid body (after the Flying V), and maybe their last valid creation... I love the very different pickups - this makes sense, why should the sound be homogeneous if your seek versatility? This Ibanez Iceman ICB08 Bass is a particularly eyecatching example of a now legendary Japanese design. Wouldn't it be fun if the control knobs were shaped like chess pieces? No, I shouldn't say that, someone will go and do it. 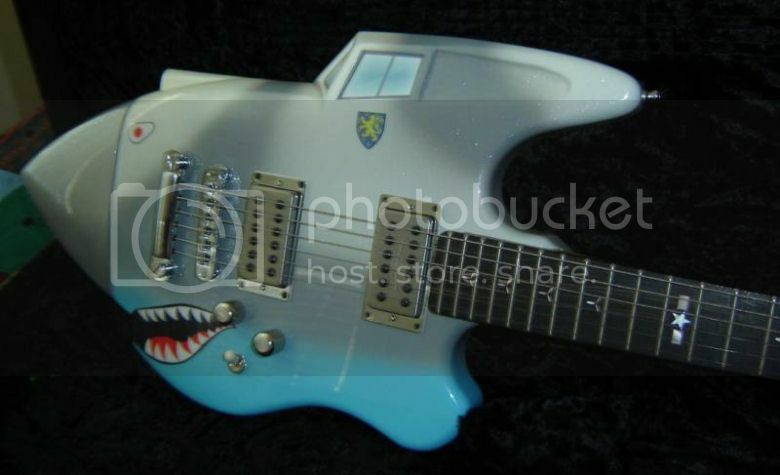 One thing that this blog has been doing for a while now is looking at the weird, the wonderful and the just plain outrageous guitars and basses listed on eBay. Recently, however, I've been finding very little to get excited over. I don't know if this is just a temporary blip or if indeed I am getting jaded after years of doing this. As ever, if you see any interesting guitars on eBay or elsewhere (if it's a Strat, Tele or Les Paul, it'll need to be pretty special!) please let us know. Bear in mind that we may have featured them before (use the keywords at the bottom of the page to search what we have already featured). Please note also I'm not too keen on taking photos from guitar forums or personal websites. eBay is, I feel, a different matter as it's in the public domain and we are helping to promote the auctions. OK, it's easy and most of our readers already know Eastwood's reissue of this Airline rejuvenated by Jack White (before he became an idol and switched to custom Gretschs), but I like this guitar a lot. It's somehow the perfect anti-Fender/Gibson guitar, and Eastwood's replacement of the original Airline 'res-O-glas' body by a chambered mahogany one upgrades the cool but cheap vintage guitar to a modern quality one. And it still has the many Italian style knobs and switches above the strings we enjoy so much, plus the very special shape (who would dare to design this nowadays? 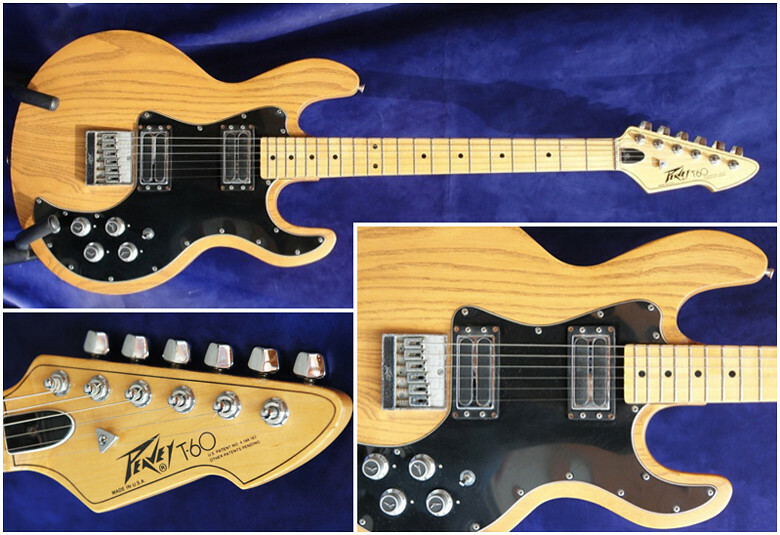 ), the german carve, and the strong presence of 3 pickups in line with a Bigsby trem. Some say that Eastwood pickups are not the greatest (the demos I heard convinced me though) but there are many replacement pickups out there - and it would make sense that one wants to personalize this kind of guitar since it's not mainly noticeable for the specificity of its sound! Several years ago, I was doing a short residency in Las Vegas. I learned very quickly that if you don’t gamble, there aint’ much to do in that city. So, I spent a lot of time clicking around the dial in my hotel room. Boring. One night after the show, the lead vocalist persuaded me to go out and see a band that he had met earlier that day on the strip. Off we went. I can’t remember which casino it was; they are all so unique and exploding with character. At some point we entered a lounge where five or six guys and two girls were up on stage ripping through a medley of pop funk hits for some dancing gamblers. So I ordered a drink, grabbed a bowl full of pretzels (or peanuts) and proceeded to settle in for the remainder of their set. The guy I was with was super charismatic, so within minutes he was dancing with most of the good looking women in the room. 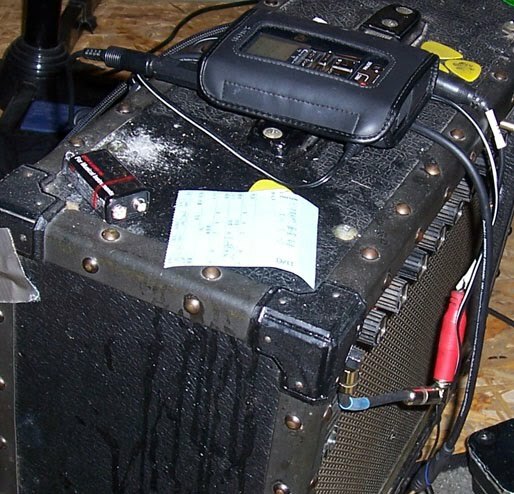 I of course was busy analyzing the sound system, what kind of pedal board the guitarist was using (Roland GT5), the vibe between the band members (bassist and backup singer were definitely sleeping together and mad at each other), guessing the chords / key signatures of each song, and so forth. This is my sad idea of fun. As I was dissecting the environment, I was starting to get this really weird taste in my mouth; kind of like when you chew aspirin. I knew I was not going to get sick, but something was not right. I began fiddling with my drink more and more, subconsciously squirming in my seat. This continued for some time and I finally realized that it was actually the sound that was throwing me off. Everything looked ok, but something just felt out of place. And then it hit me. These guys were going 100% direct. Ugghhhh… I did a quick re-review and realized that my initial analysis was very sloppy. No amps, and the drummer was using an electronic kit. The more I listened, the more everything I saw made perfect sense. I felt like I was in a space station. The volume was so perfectly perfect…. It was neither loud nor soft, it was just kind of “there,” not really emanating form any one spot. During the break, I chatted up the guitarist and found out that when they arrived in town, they had to sign a contract stating that if they deviated from a specific decibel level in the slightest, they’d be fired and forfeit their pay. He was bummed about it, but their residency was for three months, so they were thrilled to have the work. Fast forward about three years and I find myself on stage in a tiny little club in central Europe. I was doing a three month residency, 5 sets of Funk / Rock Blues each night, 6 nights a week. What a haul. But most nights, the place was packed; everyone dancing their brains out, the air was smoky as hell, and the walls just dripping in sweat. I wound up playing there a bunch of times, usually doing a one-month stay and it was always a lot of fun. The nightly cleaning crew always ignored the stage, so at the end of each one-month run, we’d spend a portion of our last night drunkenly clearing our gear out for the next band that was due to arrive in the morning. This does not have so much to do with the actual dirt that had accumulated over the weeks, but the stuff that goes along with a live gig. Even when I have played some pretty nice places, there is always some conceptual sweating and philosophical smoke. The combustion in the sound, the drinks that fall over, etc… but most importantly, there is the sound of guitars (or keyboards) through an amplifier and drums. Anything less and… and I start to get that “chewing aspirin” taste in my mouth again. Summary: I can’t fault those guys for taking that gig in the antiseptic Vegas lounge; everyone needs work, especially musicians. And in fairness, the gig I was doing that week was nothing too amazing at all, so I never meant to judge them... Not every gig is gonna be so great, sometimes you just gotta pay the bills. But I’m kinda glad that there are not too many places like Las Vegas. I think live music should not be hermetically sealed; there has to be some rough edges. I do understand that in certain situations, the manager of a club / lounge has to do whatever they need to do in order to keep the customers spending money. I’ve had some pretty weird gigs in my life, but in most cases, there are at least a few sonic imperfections, which I think is just part of the formula. It’s the human element. I think this is why a faded pair of jeans that you have owned for 5 years cannot be replicated by “The GAP”, and why “Reliced” guitars are, well… uh, let’s just say they are not my cup of tea. Bumps and scratches are part of life, even in the sound we send out from the stage. Those frayed edges give the moments of brilliance / success / harmony relevance. Of course we all strive and hope for as much good stuff as possible in our performance, but as we aim for 100%, we know that if we hit 80%, we’ve probably had a pretty good night. The other 20% of the sound / performance / solo / stage banter, etc… that sometimes falls flat, falls on the floor, or gets peanut butter stuck in it, well… that’s just part of the deal. I never really thought about all this even once, until that one time in the Vegas lounge when it was not there. Then I missed it, really bad. Over the past 20 odd years various guitar manufacturers have come up with the idea of an acoustic with a slimmer electric style neck so as to appeal to the electric player. 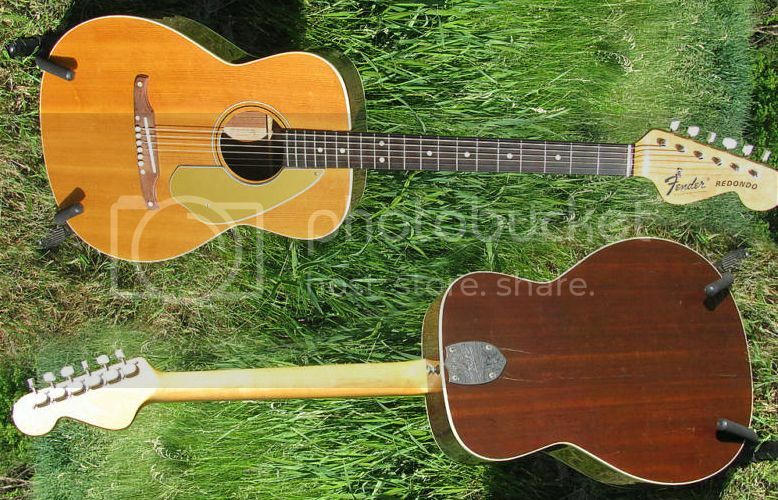 This idea, although presented as an amazing breakthrough each time it is brought up, is nothing new as this Fender Redondo acoustic from 1966 illustrates quite nicely. In true Fender-fashion, it even has a bolt-on neck. (The first bolt-on neck acoustic that I personally was aware of was the Eko Ranger). The 6-tuners-in-a-line headstock, although looking quite conspicuous on an acoustic, is more gently rounded than the more usual Strat style and is quite a pleasing shape. The almost circular body give this electric mandolin the resemblance of a table tennis bat. Its pickups are a dead giveaway, and betray it as being a product of the former Soviet Union. From the location of the controls you might think it was a left-handed instrument, but it is strung right-handed and other examples I have seen have the same layout. 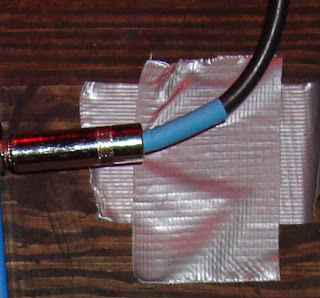 Indeed, the output jack is on the right-hand side in keeping with a right-handed instrument. 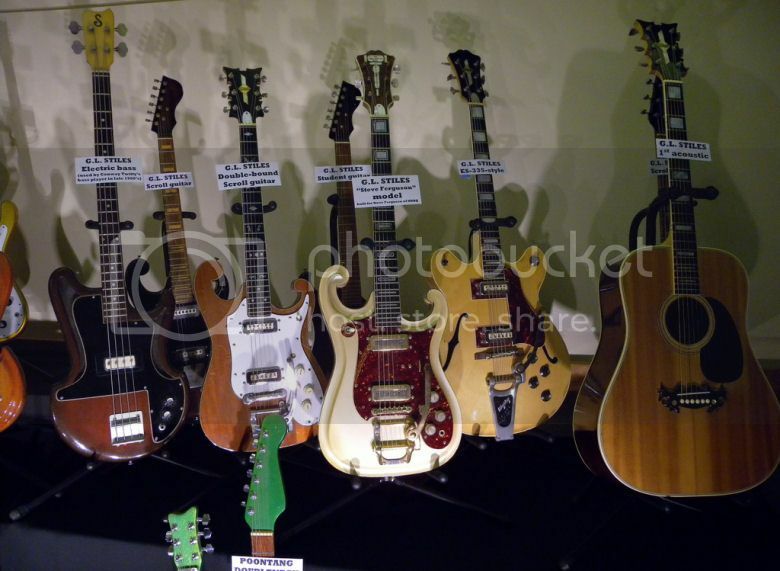 We looked at a rare G L Stiles guitar back in March - but look - here's a whole bunch of them! Guitarz reader Adam Tober sent me this photo of his collection of G L Stiles guitars as recently featured at Deke Dickerson's Guitar Geek Festival 2010 (see also here). 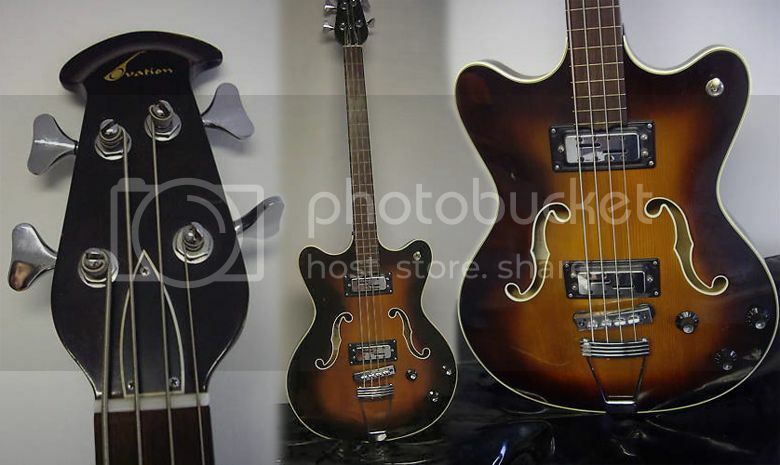 Two of the scroll-bodied guitars and a similar bass are currently being offered for sale as a single lot on eBay right now. Way to get yourself an instant collection! For those of you who are not aware of the G L Stiles brand, I shall shamelessly quote from the eBay listing: "West Virginia native Gilbert Lee Stiles began building guitars in 1961, and his small Hialeah, Florida music store quickly became the center of the budding South Florida teenage garage rock and surf scene. Eventually Stiles guitars could be seen on stage with the likes of Ernest Tubb, Brenda Lee and the Casuals, NRBQ's Steve Ferguson, and Conway Twitty." Thanks to Adam for sharing with us! Now this Ibanez DT-250 X Series guitar is, to me, very interesting. It's not the Explorer-derived design that interests me, rather it is the finish that is very similar to my own DiMarzio "cellophane Strat". You can see that despite its vivid colour, the finish is still translucent - witness the fretboard's dot markers and the skunk stripe on the back of the neck - these are beneath the finish. I'm wondering if this guitar could be another Harayama-built guitar? It's made in Japan and is from 1984, so the time and place both fit. Harayama supplied bodies and necks to DiMarzio for their parts catalogue. It's perfectly feasible that they built guitars for other brands too. Also, DiMarzio offered a very similar body design in their catalogue at around this same time. Ovation of New Hartford, Connecticut, are known - of course - for their acoustic guitars with roundbacks made from synthetic materials. To a lesser extent they are also known for their high quality solidbody electric guitars during the 1970s with models such as the Deacon, Breadwinner, Preacher, Viper, and Magnum Bass. What they are less known for is their semi-hollowbodies such as this Typhoon III bass from 1971. This particular example is fretless, albeit with a lined fingerboard. The seller doesn't mention if this is an original feature or if it was converted. Nevertheless, a shortscale bass would seem a strange choice of instrument for the fretless treatment, but it's not without precedent. Many guitarists grow up with posters on their wall. These posters at some point represent mythical figures that are worshiped and praised. Why do we honor these gods so, and does this behaviour play any useful role in our growth process? My Short answer is: "Because we don't know any better", and "Yes"
Stop: Some may say that they never did this. They picked up the guitar, took lessons, learned, and never once along the way, ever put another guitarist above themselves on the value scale. Some people are either lying to themselves or are in-fact truly unique and very talented. Both are completely possible. Now, let's forget about this 1/2 of the 1% of the population and get back to the rest of us. You have to get up every morning, go to school, do things you hate, and listen to your parents. These folks in the posters do not. So, really what is happening is that in tandem with the fact that they have been bending the cat-gut for a while and are capable of some wicked rockin’ they are also living a life you dream of. So you worship the package, the image, the concept. But that is ok because hopefully, you are worshiping someone who really makes great music, or at least motivates you to practice diligently. But what happens when you actually start to develop some real skills? Does the worship end? No, it morphs. And then I would find an interesting article about Mr. Rocker and realized that unbeknownst to me, he did every solo on the first album in one take, or he played bass on the last four cuts because Gerry McSnide was in rehab that week and the label was pressuring them to master before the holidays, etc….. But then I find out 5 years later that they re-dubbed some of the solos on the “Live in Japan” album. I’m heartbroken. But then one day I actually meet Mr. Rocker on the corner of 8th Ave. and 50th Street in Manhattan, totally stumble through some speech about how I learned to play guitar because of him and he is insanely cool, friendly and easygoing. 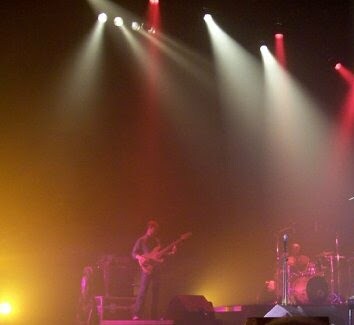 Now I go back and listen to “Live in Japan” again, and realize: It rocks. So what if a few of the solos were over-dubbed. Jimmy was super nice that day I met him, and I always liked their tunes anyhow. Summary – This was all a bit tongue-in-cheek. Your “Jimmie Rocker” could have been Pat Metheny, Johnny Marr, Earl Klugh or some other legitimate axe-slinger. Point here is that I have found myself re-examining my idols as I’ve gotten older. Some I let go of many moons ago. Some I feel like I’ve grown up with and they have been kind of like the big brother who does not know me or give a crap about me. That’s ok. If I was Pete Townshend, I wouldn’t give a crap about Kevin Chisholm either. But as I’ve grown as a person and (hopefully) a guitarist, I’ve come to understand my fascination with certain musicians, most of whom are a generation ahead of me. The ones who I still admire, I see with much more depth; they no longer exist on a piece of poster-grade paper on my wall, held in place with push-pins. They are people. They do stupid things, make great albums, marry super-models who take all of their money, inspire many young musicians, license their name out to crappy products, make incredible music that I really connect with, license their name out to pretty good products, and so on. I don’t really know how my journey through the world of guitar would have been without my heroes. They inspired and motivated me. Even though I realized as an adult that they are less than perfect, it is that complex imperfection that makes them even more inspiring. I now know how much patience and effort it takes to ride in a van for 12 hours to get to a gig or how important it is to hear a band mate out when they have an idea, even if you think their idea is retarded. I never knew or thought about this kinda stuff when I was 14. I just thought my idols walked around in their stage clothes all day and were best friends. Even though my personal experience involved a lot of self-discipline as well as trial-and-error, growing old with my guitar gods has also been an interesting experience that has provided me some useful perspective on the music business, and in a funny way, some of life’s ironies. If everyone was a big rock star, then being a big rock star would not be such a special thing. If everyone was a really cool person and just loved to play guitar as much as they could, I think that would work out pretty well. Sad news. Tony Peluso has died aged 60 of heart disease. He'll probably be best remembered for that classic solo and outro in The Carpenters' "Goodbye To Love" (above). 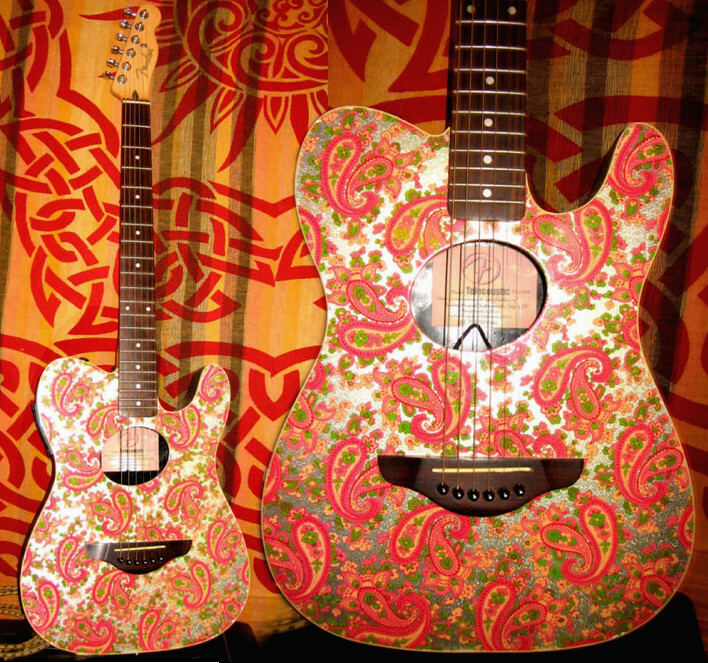 I've been sorting through piles of my personal photos today, and found this one of my two trusty Fender Japan paisley-finished guitars, which were my main two instruments for many many years. I view this photo with some regret, as I unfortunately had to sell this pair to help pay the bills a few years back. Both were very early examples of these Japanese guitars, with the Tele being, I believe, one of the now legendary JV series. I did tell myself when these went that I would never get so attached to a guitar again so that I couldn't sell it on. Yea, some chance of that! I've currently built up a collection of too many guitars, but can I make the decision about which should get the chop? Can I hell! Dismissed in 1987, it is now a highly appreciated classic vintage guitar, not the one you can show off with but one you can really play with! Back in August of last year we took a look at the Czech interpretation of a Les Paul bass with this Jolana Diamant. Leave it to the Japanese to come up with the most convincingly Gibson-esque Les Paul style bass, the above-pictured Greco. 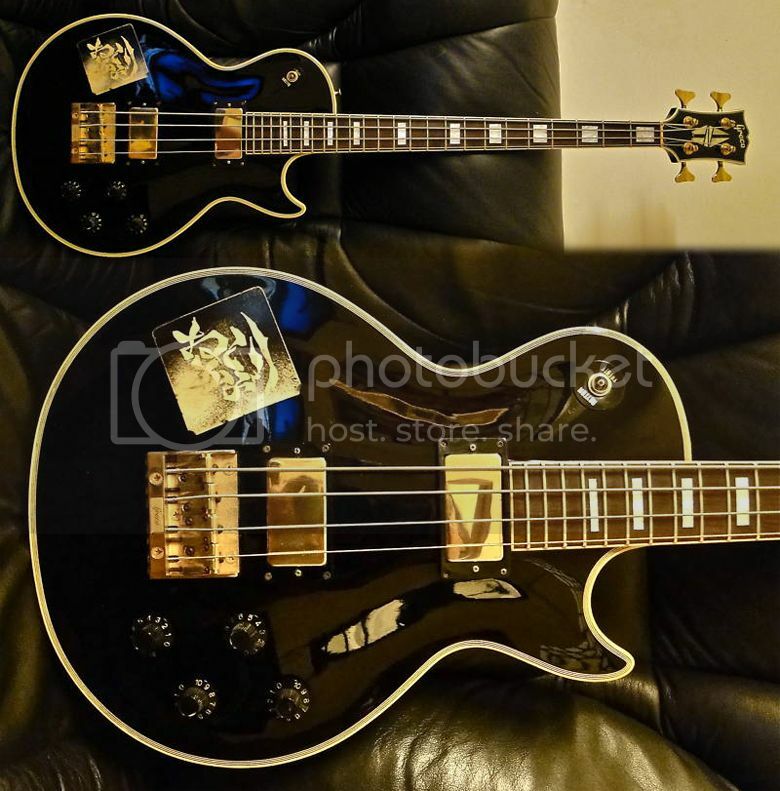 Whilst Gibson have made several Les Paul basses over the years, I don't believe they have ever made one based on the Les Paul Custom, certainly nothing that looks as good as this. Greco, along with Burny, are known for their quality Gibson replicas, with some guitarists even preferring them to the originals. It seems they also ventured into the realm of fantasy instruments, ones that Gibson could have built but didn't. The bass appears to be short-scale (judging by the bridge position) and has a set-neck as it would have done had Gibson built it. It is apparently a model built for the Japanese market only and few would have been seen outside of that country. Oh, and shame about the stickers. 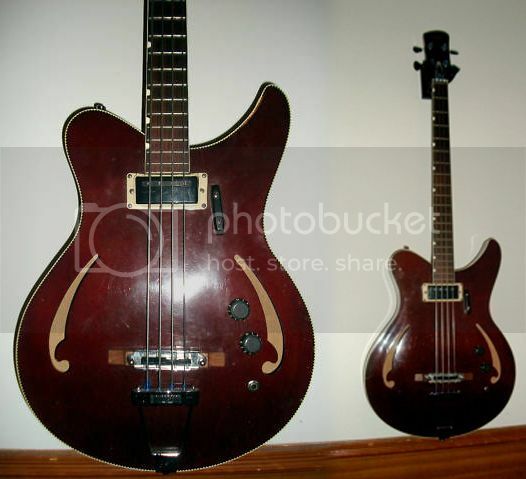 We've all seen Gibson doubleneck guitars before - indeed the Gibson must be the best known exponent of this particular type of instrument - but I, for one, have certainly never set eyes before on a Gibson doubleneck bass with four-string and six-string necks. Made in 1970, this is allegedly one of only eight such instruments built. Note that the seller insists on referring to the 6-string neck as a "baritone", but it was much more likely conceived as a 6-string bass especially given the date. Regular readers will know that I have a bit of a thing for vintage Yamahas. I also have a soft spot for short-scale basses and think that semi-basses look really cool, so you can imagine that something like this Yamaha SA-17 bass would cause much salivation even if it did not automatically make me reach for my wallet. This is, of course, the bass sibling to the Yamaha SA-15 guitar. Both guitar and bass, made between 1968-1972, look as if the Japanese have borrowed heavily from the designs of Rickenbacker and given them a twist. They even have the checkered binding. This guitar is a tribute to the United States Army Air Corps' Curtiss P-40 Warhawk/Tomahawk/kittyhawk aircraft. Dubbed the Tour Hawk, it is one of 12 such guitars built by Shada Specialties and Wilkins Guitars in Los Angeles. This particular example is currently for sale on eBay with a Buy It Now price of $1500. 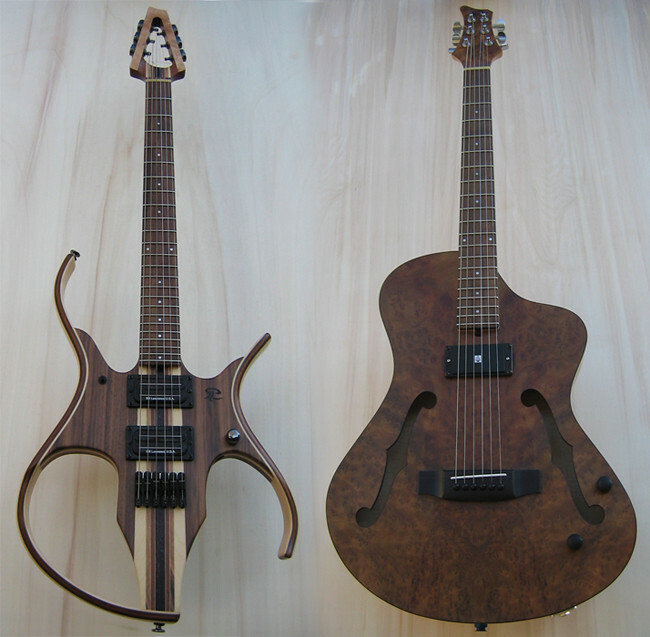 The Bassimer is a bass guitar/dulcimer hybrid designed and built by John Shelton. It has a 30" scale length and features a fretless low D and a two strings arranged as a paired course in the highest position. The tuning is D1, A1, D2, D2/D3. The paired string course also has its own sustainer, an EBow built into the body. It's probably easiest to let these videos do the talking! Thanks to Buck for bringing this very interesting instrument to my attention. This is an Aria Pro II Integra, quite special for a superstrat (I think that this is still a superstrat, however far it is from a stratocaster), with its prominent upper horn. The construction looks really serious, and the design is well balanced - neither fancy nor boring. Everyone steps on something... at least once. Drive is kind of like skin color; everyone has some, but how much and what shade of color is a big aspect of the visual differences between humans. In much the same way, how much drive and what shade of it you have in your signal plays a big role in your tone. are starting out from different places. I find the same with Overdrive. What I find funny, is that people actually debate which overdrive pedal is “better”. Well, it really depends on what you are trying to accomplish. It seems that one of the most popular “Goals” for a pedal is: “Plexi in a box”. If I see one more ad in Guitar World that says that I am gonna bonk myself in the head with a giant stick. If you want to sound like you are playing through a plexi that is dimmed, then plug into a plexi, run your fingers across the dials, and then proceed to rock out accordingly. ...’cmon… you all know at least one guy like this. I’m man enough to admit that I was that guy once in my life. Point here is that there are all these classic tones that folks often want, and they want to reach for a spray can, spritz the room and then enjoy the smell of a “Plexi” or a “Vox” or a “Tweed” or a “Quadruple Rectifier…” Etc. I know that many do not base their sound on a particular model but just twist and tweak and surf the airwaves for the tone that feel works best for the moment, a song, or a lifetime, but the fact remains that unless you play very clean, or can afford to push a little air, it is likely that at some point, you have, do, or will, stop on a box for the right amount of juice. Most out there have tried a few overdrive pedals in their life, some have tried many. I have definitely blown more than a few million bucks tyring as many as I could get my hands on. While I do have my favorites, I aknowlege that they are my favorite because they work best for me. I defintely don’t think that they are “the best” because the next guy or gal might be tyring to get a more thick-mids tone with lots of gain, instead of the jangly semi-clean tone that I like. Everyone like / wants / needs something different. I have found a few pedals that I feel offer a pretty wide range of drive that allows you to go from darn-clean to dam-driven. Personally, I feel the Radial Tonebone Trimode, Tonebone Hot British and Fulltone OCD are quite goodin that area. I’ll never say “Best”, but these three offer a great range, plenty of transparency as well as less-transparency (if you want that). Then again, some might use an overdrive for Metal Sounds, or want the best Guitar Pedal for the Van Halen Tone, Eric Clapton’s Tone, or what have you. It’s a big world with lots of choices. I tend to bristle at the “Plexi in a box” or “Fender Deluxe Reverb in a box” kind of thing. But some of those are not too bad in their own way and hey, if someone plugs into it and finds their holy-grail sound, more power to ‘em… I mean, who the hell cares what Kevin Chisholm thinks? (Note: do not feel obliged to agree with that statement). There are a few that I have come across over the years that I loved merely for the kitsch factor. While Menatone does make some really great pedals, the "King of the Britains" is the one I loved. Of course they couldn’t name it “This pedal will make you sound just like you are playing through a Marshall”… so they came of with King of the Britains. I love it. Not a bad pedal. Not a holy-grail, but it does sound ok if you can turn up your amp a little bit (it sounds kinda lame at low volumes). and just downright lovely… and the feeling of literally doing a whole 3-set night with one guitar, one pick, one cord and one amp was one that I liked. Summary: Well, I’ve picked another topic that has many right and wrong answers depending on who you ask. But the “Concept” of drive is in everyone’s tone. Some have very little, some use a lot, most of us fall somewhere in the middle. It’s hard to get much useful drive strictly out of an amp at low volumes, you often cannot turn up too much, so….we gots the pedals. And the pedals come in more flavors than Baskin Robbins ice cream. Which flavor of ice cream you choose is very personal as is the choice of cone (I prefer wafer) and if you like sprinkles (I like a lot of ‘em). Don't know if you've covered these before, but I just came across this Sonic F Z7 guitar on a trip to Seattle this past week, and it's a really rad and unique guitar! I just love the body design and 2 tone wood. The P90/humbucker mix gave it a nice variety of tones, and the kill switch is fun to play with. Well priced, too, at under $700. Thanks for that, Tim. This isn't a brand that I was aware of. It's good to see contemporary instruments that do not adhere to the same old usual templates. 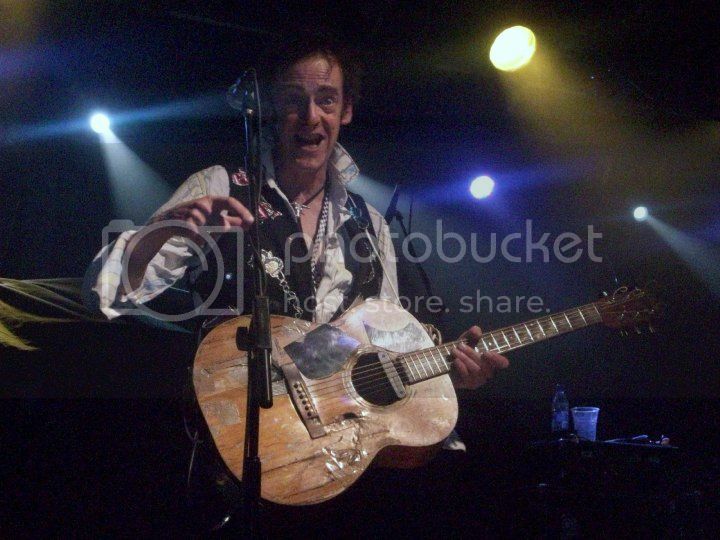 I just wanted to show these photos of punk legend Edward Tudor-Pole (formerly of Tenpole Tudor) and his beaten-up acoustic. I was astonished that the guitar with its severely warped and cracked top - complete with dents and holes - actually doesn't implode under the tension of strings tuned up to pitch, let alone the fact that it actually sounds fanstastic! I am, of course, reminded of Willie Nelson's "Trigger" which also has a large hole worn away where his fingers hit the top. 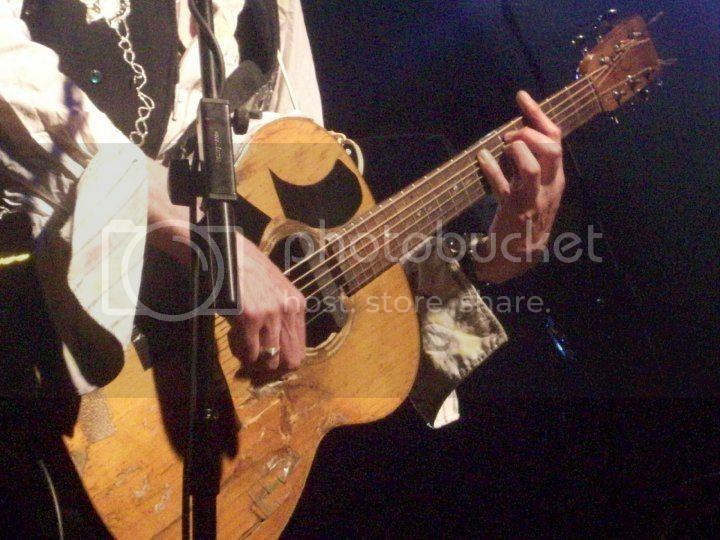 If anything, Tudor-Pole's guitar looks even more worn. No idea of the brand, by the way. 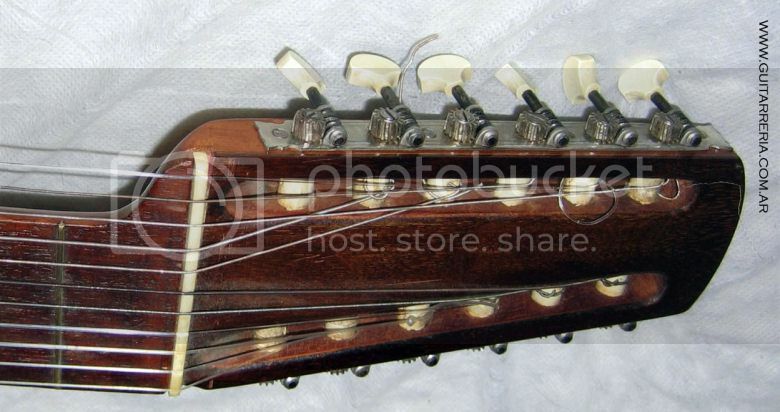 The headstock is Martin-esque, possibly it was one of their sub-brands like Sigma. Thanks to Olivia Broome for these photos. EDIT (22 Sept 2014): This guitar has now been repaired by Fylde Guitars. It's been a while since I last posted about a luthier, but I found here a pretty fine one, a French guy called Paul Lairat. Just look at these guitars! I of course selected his most noticeable guitars that also fit my taste! First on the right you can see a semi-hollow model with F-holes, a Benedetti (high end French brand) humbucker in neck position, a piezo pickup under the bridge and a bizarre finish - it looks like wood trying to imitate Formica! I'll leave you to make you own comments! (Thanks to Brad Olson who found this oddity on Craigslist). The Rickenbacker Model B lapsteel from the 1930s is one of the guitars I listed in the "500 Guitars" book; alas there was no accompanying photo published. The guitar was typified by its bakelite body inset with five chrome plates. In 1935 a "Spanish" version was introduced with a regular round-backed detachable neck. The example pictured above is even more of a rarity, for this is the 4-string tenor guitar version. This well-played example is currently for sale on eBay with a starting price of $2,000. Last night I walked past the local pawn shop in town, and saw this beautiful guitar in the window. I called them up this morning and they basically wanted to throw it away, so I walked down there and purchased it for basically nothing. It was in terrible shape, but there is nothing a little tweaking, polishing and some steel wool won't fix! Now it plays great! What caught my eye was the control plate, which you normally wouldnt see on an electric acoustic. I've also always had a thing for Bigsbys, and especially the (at least what I think it is) aluminium bigsby bridge! Another interesting feature is the neck joint. It looks just like it would be a glue-in neck, with a long neck tenon and fretboard overhang, but it's got a neck plate with four screws. The fret markers are usually on the 3, 5, 7, 9th and so on. But on this piece, I don't know if sombody at the factory screwed up, or maybe it's just a design twist, but there instead of the 9th fret, the marker is on the 10th. It does mess with your mind a little, and makes it a bit harder to play. So why do I want to post this guitar on the Guitarz blog? I really don't have any idea who made this guitar. The only clue is that on the back of the head it's stamped "Japan", which I would imagine it would be anyway. Does anybody know what year, or at least decade it is made? 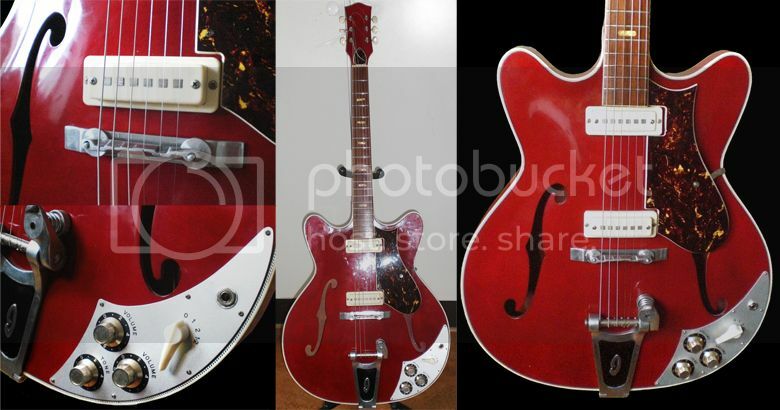 I know the Bigsby is an early Ibanez, but nothing else about it screams Ibanez. I'm sorry about the somewhat bad pictures, but my good camera is gone. Thank you again Gavin and Bertram! Thanks Pelle for showing us this. Nice find! I'm afraid I don't know for definite what it is either, without throwing forward the names of the usual suspects of this era from Japan, namely Kawai and Teisco. The body does remind me of Seasick Steve's 3-stringed "trance wonder" - I believe that's a Japanese guitar too. However, the chances are that if the trem is marked with the Ibanez "I", then the guitar itself is an Ibanez. The trem might be retro-fitted, but I feel it's unlikely. Don't be put off by the lack of resemblance to modern Ibanez guitar - early Ibanezes came in a wide variety of designs often copied or at least inspired by the ever popular models from Fender and Gibson. Don't read too much into the 10th fret marker instead of the marker being at the 9th. This was standard practice on older guitars, and other fretted instruments (tenor guitars, banjos, mandolins) often continue this tradition to this day. 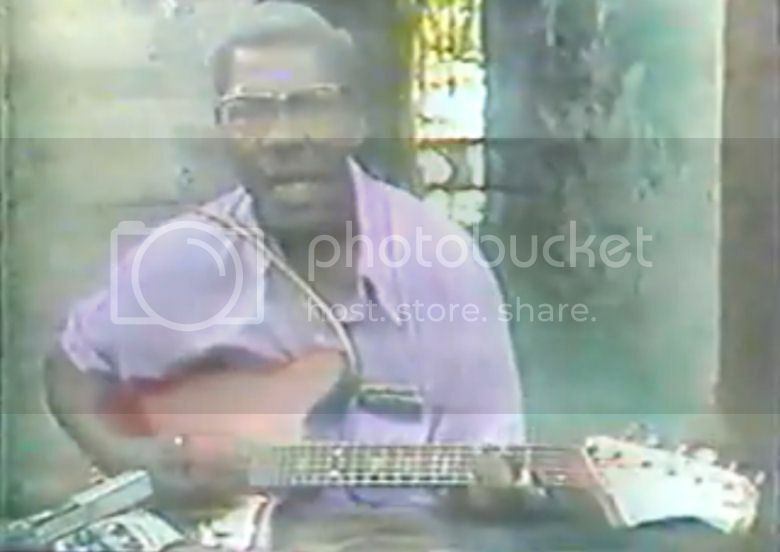 "Hello, I am a fan of African guitar music, and the video below is of one of the masters of the instrument in Africa, Albert Luampasi. Is it possible to you to identify the guitar that he is playing in this video at Youtube? Hi Emerson, I really can't say what that guitar is. It looks 1960s Japanese to me, but could equally be a guitar of 1960s European origin given the pushbutton controls, whilst the headstock looks Silvertone/Danelecro. The strings have a very un-metallic sound to them. I wonder what strings he is using here. I note he has a microphone in front of the guitar. Perhaps the guitar's pickup isn't even functioning or is itself microphonic. 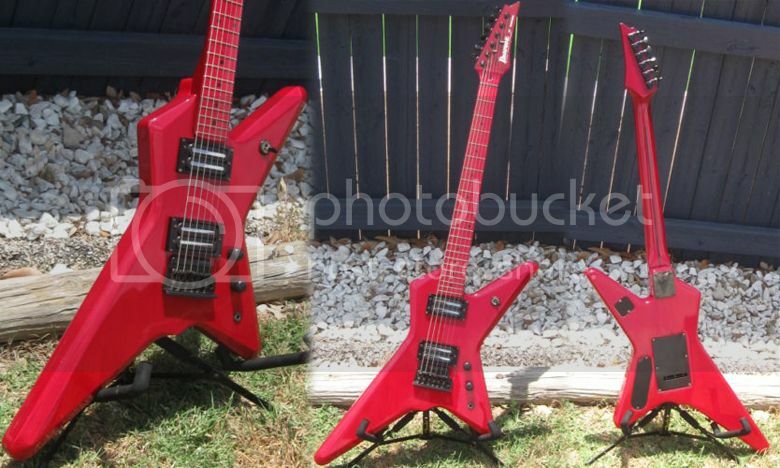 Anyway, do any Guitarz readers have any clue as to the identity of this instrument?